LearnToCaption.com is now offering Translation Tune-Up, a webinar and a half hour of one-on-one training to help court reporters learn to cut editing time in half. On April 16, Vents Magazine posted the top 10 reasons to hire a court reporter. I live in Iowa, but I make my living listening to the Canadian news. I work for The Captioning Group, Inc., based in Calgary, Alberta, as a remote broadcast captioner four days a week. But every Thursday, I take a break from the news and travel to Newton, Iowa, to teach court reporting students at the Des Moines Area Community College. My goal is to share my wealth of experience with my students. I have worked as an official shorthand reporter, a freelance reporter, a CART captioner, and a broadcast captioner, and I bring this real-world experience to my classes. As a busy broadcast television captioner and an instructor of court reporting students, I encourage my students to embrace realtime. If my students comment that it is difficult to learn realtime, I remind them that when I went to court reporting school, there were manual Stenograph machines and typewriters. Long vowels? That would be taken care of when reporters sat down at the typewriter to type each page into English from their paper shorthand notes. Nowadays, this is all done instantaneously through high-tech machines. But more so, I believe that realtime is vital to the continued successful future of the court reporting profession. A digital recording in a courtroom cannot accurately provide a real-time speech-to-text feed of the live proceedings to the judge. And a digital recording cannot provide live captions of breaking news or emergency information broadcast over television stations where realtime captions are needed to save lives. At first, realtime stenography can seem quite daunting. But excellent instructors and programs can get students on the path to achieving their goals and becoming successful in the field of realtime captioning. Here are seven tips from a broadcast captioner and court reporting instructor to get started on your journey to learning realtime. Enjoy realtime and the great feeling of success when steno words translate into English correctly. Do not be afraid of realtime. Analyze and correct every word that does not translate from steno to English correctly. There is a reason for every untranslated word. Why did that word not translate? What can you do to correct that word to make it translate properly for your next transcript? Do not ignore untranslates! Know your dictionary and how words are going to translate with your dictionary. Finger combinations that work well for one student may not work well for another student. Try the suggested way to write the word. If the finger combination does not work for you, try writing it in a way that will translate for you. Define the word in your dictionary that way and write it down. Practice that word until you have memorized it. Briefs are good only if you memorize them and remember them quickly. A bad brief is worse than no brief at all. Your goal is a good realtime translation. Write out every word and add it to your dictionary for the time when you forget your brief. Do not hesitate to remember briefs. Your goal is great realtime translations, not winning a race for having the most briefs and then hesitating during speed tests trying to remember those briefs. Briefs can be your best friend or your enemy in realtime reporting. Back up your dictionary every week. Email a copy of your dictionary to yourself and back it up in the cloud. 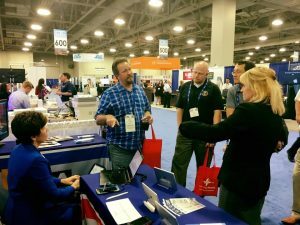 Attendees at the 2017 NCRA Convention & Expo had the opportunity to attend an array of sessions and educational workshops designed to help them increase their professional experience and hone their skills. The summaries below highlight a few of these sessions. “I won’t be mean,” Meadors said, “but I will be firm to get what I need,” especially for CART or captioning work. The presenters all said that they do prep the night before — although the length of time varied a bit based on how important the trial was, how many people would be seeing the realtime, and if there would be a rough draft, for example – but also emphasized the importance of arriving early to the job. Shainline said that while she often prepares brief forms the night before, after she sets up at the job, she does some practice with those briefs to help get them into muscle memory. cable management gadgets, including the Baltic Sleeve, which is a Velcro sleeve that wraps around a bunch of cables, and the Safcord, which is also a Velcro solution that performs the same function as gaffer’s tape, except it’s reusable. 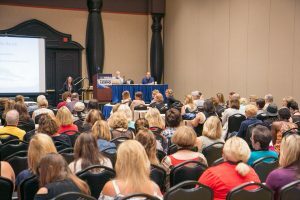 In a session that was part of the Student Learning Zone at the 2017 NCRA Convention & Expo, Chase Frazier, RMR, CRR, CRC; Tami Frazier, RMR, CRR; and Ron Cook, FAPR, RDR, CRR, CRC, gave concrete tips to students on improving their writing while getting through school. The three presenters came from a variety of perspectives: a captioner, an official, and a freelancer. Tami taught both of her sons (Chase and brother Clay Frazier) to write steno, and she did so paperless. She also emphasized perfection. When Chase was at 200 wpm, she saw that while he had the speed, he was writing sloppy and with no punctuation. She had him go back to 160 and work back up while also working on writing perfectly. Chase attributed this experience to his strength in realtime. “A lot of people don’t emphasize the mental part of practicing,” said Ron. “If you don’t think you’re going to get it, you won’t get it.” He provided a couple metaphors for practicing, including “slow things down” — meaning to slow things down mentally, stay relaxed, and go with the flow. Tami recommended practicing about 10 percent faster than her goal speed (which was a technique that she used to get through school). “You always want to be pushing yourself,” she said. Pick tough dictation, she suggested — “and I’m a real believer in lit — it makes you write; there’s nothing easy about lit,” she said. She also suggested practicing a five-minute take at least ten or fifteen words per minute faster than the goal speed. But since she also emphasized aiming for perfection, repeating a take until writing it perfectly will clean up a reporter’s writing and also gives the reporter an opportunity to work in briefs and phrases. “The better writer you are, the easier the job,” she said. Introducing yourself at the beginning of the deposition: Kitt said she makes a point of greeting all of the lawyers in the room with a firm handshake. Waack expanded on this by saying that she makes sure her ears are over her shoulders over her hips, so she’s standing with confidence and not hunched over. Swearing in the witness: Waack suggested having a physical piece of paper with the oath to refer to. She also said to make sure to include “swear or affirm” in the wording, since some witnesses don’t want to swear, and to avoid the phrase “so help you God.” Hensley pointed out that reporters should always check with their state association or firm first to see if there’s a preset oath that the reporter should be using. Using briefs for names, words, and phrases: For briefs, Hensley pointed out that they don’t have to make sense on paper as long as they make sense to you to write. Kitt said she likes to get to a job at least 30 minutes early so she can use the time to jot down some briefs. And Waack suggested using LinkedIn to find the proper spellings of witnesses, etc., although she added that this will likely lead to some odd friend requests. She also said that after she’s developed a brief for an acronym, if the speaker suddenly uses the full term, she simply writes the brief twice. The witness is talking too fast: Kitt said, “Don’t ever depend on your audio,” stressing that it’s the reporter’s responsibility as the record-keeper to keep in control and stop any fast talkers to tell them to slow down. Waack says she likes to reset the speaker to the point where she lost the record by saying, “You were talking about [subject].” And Hensley favors using a visual hand signal – physically lifting his hands up off the machine to show the room that something is up with the reporter. Hensley also emphasized throughout the session the importance of knowing your software. Stanley Sakai, CRC, led a session that focused on captioning in other languages, especially Spanish. The discussion was guided partially by Sakai’s prepared presentation and partly by the audience’s questions. Sakai has a working knowledge of eight different languages with varying levels of fluency, including Dutch, German, Japanese, Korean, and Spanish. Prompted by a question from the audience, he explained that one of the methods he uses to keep up with such a wide variety of languages is to have different devices set to different languages (for example, his tablet set in one language and his mobile phone in another). He also takes the opportunity to look up words he encounters on the fly and to read articles, etc., in a language other than English so he learns content and vocabulary at the same time. The session description specifically highlighted Spanish, and the growing need for Spanish captioning came up in the discussion, both domestically and abroad. Sakai talked a little bit about the differences between baseline speeds in English and Spanish and how Spanish is at a slightly slower speed. He also discussed his methods for doing CART work in German and how steno systems work in Korean and in Japanese. Sakai had to adjust his steno theory in order to provide CART, which was for a German language class, and he even had to be prepared to jump between German and English. Similarly, in the discussion, he pointed out that the Korean and Japanese languages toggle between different writing systems based on the specific words, and reporters and captioners in those countries need to have keyboards that are set up to quickly switch between the writing systems at the speed of spoken language. Being realtime-capable should be the goal of every court reporter. My realtime goal is to always strive for 99.8 percent translation rate on every job. The prep work is essential to maintain or exceed that goal. My writing is constantly evolving (even after 30 years of reporting). Writing short is paramount to the success of my translation rate, for keeping up with the fast talkers, and also being kind to my body — specifically my back and hands. The Oct. 2015 JCR has an article, “Preparation guide for flawless realtime output,” with lots of great tips from some amazing court reporters across the country. Definitely worth the read! Recently, I’ve focused on brief forms. Creating briefs on the fly is an acquired skill, for sure. The BriefIt feature in my Case CATalyst software (and other CAT software vendors have similar features) is an integral and valuable resource and helps immeasurably with my high translation rate, even though the proceedings could be a fast-paced deposition. (It takes focus and dedication to be able to look at the screen during the proceedings and capture those suggested briefs. During a recess is a good time to take a few minutes to go over the suggested briefs. With my software, the phrases I stroke out the most (with a suggested brief) are highlighted in a bolded color. Genius! It’s easy to concentrate on the strongest colors and make a note of the suggestions. Our minds have great capacity to recall all kinds of information. I feel it’s good to have a multi-prong approach to memorizing brief forms. Remember to take a handful of briefs at a time to incorporate into your writing; otherwise, you’ll be overwhelmed and could end up dropping important testimony. Be sure you want to improve your realtime writing and are invested in the process. Write out the brief forms you wish to incorporate into your writing. Apply repetition to your practice. As I said, make sure you start with small bits before moving on to the next round of briefs. Keep this in your memory banks before moving on to the next set. Do most of your studying in the afternoons. One study suggested your ability to memorize relates to the time of day you study, with the afternoon appearing to be the best time of day. Ensure you are well rested in order to retain the memories. Make sure you take breaks and come back to it later in order to find out how much you actually retained. Then you can focus on the briefs you might have more trouble with. Next are the steps I’ve implemented that have greatly improved my ability to incorporate new briefs into my writing. Use your briefing software feature all the time during the job and add the briefs that make sense to your personal dictionary. Dictionary building is key to the success of a higher translation rate. Make sticky notes and attach to your writer or computer. Use the app like Sticky Notes. This is a great tool to use because you’ll never lose that physical note again. Simply open the app and move it to the side of your laptop screen. Multiple colors are available for families of briefs! I like to use my Recorder app on my iPhone to dictate the briefs I want to work on. By recording the words and phrases, it is an easy task to set up my writer to practice on those briefs. You will get instant feedback if you are writing the briefs correctly when you are hooked up for realtime during your practice session. The last prong of my process is a cool app called Tinycards. This is a free flashcard app to help make memorization more fun! This app is a game where you can unlock new levels and keeping your memory strength bar full! Tinycards uses spaced repetition and other smart learning techniques to help you master new material efficiently. You can create your own decks and share them with friends or pick from a variety of collections exclusive to Tinycards. You’ll find constellations, country capitals, history, and lots more. I’ve already created two Tinycards called Steno Brief Forms – Part 1 and Steno Brief Forms – Part 2. When you set up your new (free) account, simply search for these and any other topics to add to your stream and start memorizing those briefs today! Lynette L. Mueller, RDR, CRR, is a freelancer reporter in Johns Creek, Ga. She can be reached at lynette@omegareporting.com. She reports that a short video will be on her blog at the beginning of the article. Earlier this year, Watson, the IBM artificial intelligence computer that first gained fame in 2011 by beating past champions in the TV game show Jeopardy, publicly returned to the stage. The category: Speech recognition. At a San Francisco tech conference this past spring, IBM officials announced that Watson is now able to hold conversations in English with a word error rate of 6.9 percent. Watson’s latest feat of 94.1 percent accuracy is fairly impressive — though it should be noted, it’s still well below the 98.5 percent accuracy rate required by many captioning companies. But Watson and IBM are not alone. During the past five years, speech recognition has emerged as a hot industry, with progress being made on issues such as accuracy and noise filtering, and not just by established players like Nuance, but also from major tech giants like Apple, Google, Amazon, Microsoft, and the Chinese search/e-commerce firm Baidu. A recent study, Global and China Speech Recognition Industry Report 2015-2020, projected the global intelligent voice market will grow from $6.21 billion in 2015 to $19.2 billion in 2020. In China alone, voice recognition is expected to be a nearly $3.8 billion market within four years. The good news for court reporters is that, thus far, few of these new speech recognition breakthroughs seem to be aimed at their livelihood of transcribing spoken testimony into 100 percent accurate and properly formatted legal documents. Instead, most of the focus is on speech recognition as a consumer tool by getting smartphones or car entertainment systems to respond to verbal commands. The highest profile example of this trend is Siri, the Apple app (based on Nuance software) now built into iPhones, iPads, and iPods that lets the owners use their voices to send messages, make calls, set reminders, and more. Outside of the consumer space, the segment where speech recognition has been gaining the most traction is as a personal productivity tool for busy professionals, especially those in the medical/healthcare industry. “The push in the medical field for electronic medical records makes it a great market to be in,” says Henry Majoue, founder and CEO of Voice Automated based in Lake Forest, Calif. Majoue adds that doctors and other medical professionals use software customized by his company to dictate notes and other directives that are automatically turned into electronic text and included in patient files and other medical records. Peter Mahoney, Nuance senior vice president as well as general manager of the company’s Dragon Desktop division, adds that the improved accuracy of speech recognition is helping to drive adoption in a host of other industries as well. “There are plenty of areas where we’re seeing a lot of growth, including the public safety and financial service professionals,” Mahoney says. Those groups now outnumber the people with hearing issues or other disabilities who were previously among of the first adopters of Nuance speech-to-text solutions. With accuracy that’s good but not close to perfect, voice recognition tools could soon help universities and other public and private institutions go through vast archives of video and audio records, including lectures, speeches, and seminars, and make them searchable by keyword. But the next step, moving from voice recognition using a single user in a controlled setting to one where there are multiple voices in a noisy room, continues to be out of reach. Those limitations in a multi-voice environment is one reason why speech recognition hasn’t been even more widely adopted by the deaf and hard of hearing, who were one of the earliest supposed beneficiaries of speech recognition. With plenty of pent-up demand for speech recognition tools that can work with multiple voices and in rooms with less-than-ideal acoustics, Mahoney suggests the solution may not be that far off. Mahoney adds that the development of voice biometric systems that can identify different voices, separate the speech, and label the speaker could also soon be a key component of speech recognition software from Nuance. Even with these improvements, Mahoney says there will still be many things that court reporters do today that voice recognition software simply won’t be able to match. Speech recognition has been on the radar screen of the court reporting community for two decades or more. Given all the recent improvements in speech recognition technology, is now the time for court reporters to start to worry? Right now, the answer to that seems to be yes — and no. There are already companies out there in other parts of the world promising speech recognition as part of their courtroom technology, but given the current technology limitations, most of those claims can easily be dismissed as unproven hype. Farmani stops short of suggesting reporting firms begin investing in speech recognition tools in the same way many have invested in other technology trends like videography and cloud-based storage. Because of that, Olivas recommends that court reporters not fret over changes in technology like speech recognition, but simply be ready to adapt when they do come. David Ward is a journalist in Carrboro, N.C. 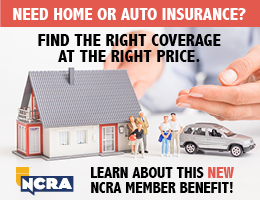 Comments on this article can be sent to jcrfeedback@ncra.org. Last August, NCRA member Julie Hohenstein, an official realtime court reporter for the Hon. 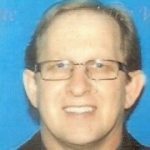 Stephen A. Wolaver, Greene County, Ohio, added a Certified Realtime Reporter (CRR) to the Register Professional Reporter (RPR) certification she already held. Hohenstein said her judge was so happy with her earning the certification that he offered to be interviewed, along with her, to share thoughts on why realtime is a benefit to have as a skill and in the courtroom. 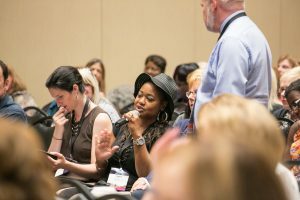 Why did you decide to pursue the CRR credential? Hohenstein: Ever since the CRR certification became available, I have wanted to achieve it. I think having the CRR says that I am on the cutting edge of my profession both in technology and skill. I think the CRR designation earns me immediate respect among professionals in the court reporting and legal fields. I had attempted a couple of times when the CRR was first offered, and then I was discouraged because I didn’t pass it. I always knew I could. After attending the 2016 NCRA Convention in Chicago and participating in the CRR seminar and learning more about how the online testing worked, I decided to go ahead and try again. I really liked the convenience of being able to take the CRR in a setting that I was quite comfortable and familiar with and on a date that I chose. I especially liked the fact that you can take the CRR up to three times in a given quarter. What do you think are the benefits of realtime? Hohenstein: For me as the court reporter, I use realtime to improve my writing skills. I watch my realtime to see areas in which I need to improve on my skills. I think no matter who you are, there is always something that we can do to make our writing better. For the attorneys, I think the benefits are the ability to see and reread what the witness has just said or had said previously. We use the iCVNet with iPads in our courtroom, and to have at the attorney’s fingertips the ability to search back through the transcript for certain areas of testimony and mark it and then be able to refer to it is an indispensable tool. Also the ability to search a word or phrase and see every single time it is used and to be able to go to that spot with just a tap of the finger is invaluable. Judge Wolaver, when you first saw realtime, what was the most exciting part of it for you? Wolaver: Having the knowledge that I would not miss anything, that I could see testimony immediately, it would aid me in making rulings and also the ability with the iPads to search back through the day’s transcript for any discrepancies in witnesses’ testimony. I find that having the iPads with the realtime gives me the flexibility to take the transcript into chambers to review before I make a final ruling, if necessary. How often do you use realtime, and who in the court uses it? What is your setup like? Hohenstein: In our courtroom, I provide realtime to the judge and both plaintiff’s and defendant’s counsel on a daily basis. All parties involved use the realtime whenever they feel the need to. Our courtroom is setup with the judge and both counsel having an iPad to receive the realtime feed via Wi-Fi and ICVnet. There have been many times that I have noticed that the defendants themselves have used my realtime. Have any attorneys, clerks, or deaf or hard-of-hearing jurors or parties used the realtime feed? Hohenstein: Yes. I have watched both plaintiff’s and defendant’s counsel use the realtime that I provide. Just recently, we had a trial where a potential juror had a severe hearing loss and tinnitus. The juror could let us know that they could not hear any of the Voir Dire examination that was being conducted, and they were able to follow along with the iPad to complete the Voir Dire process. We also had a 14-day civil trial where both plaintiff’s and defendant’s counsel wanted realtime and a daily rough copy of the day’s proceedings by the end of the day. What situations do you think that realtime is especially helpful for? Hohenstein: I find that in all situations realtime is helpful. Realtime helps me if I mishear something a witness says. I can immediately look at the screen and read it again to confirm what I thought I heard the witness say. Why do you think that realtime is so important that you wanted Julie recognized for pursuing being certified in it? Wolaver: Julie goes above and beyond and excels in all aspects of her job duties. She has great dedication and respect for her job and wants to always improve her realtime skills for everyone that comes into our courtroom, and the public we serve should know of her dedication to justice. 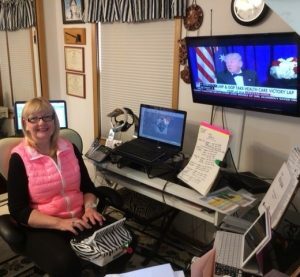 At a time when many courts are replacing court reporters with ER systems, I find Julie’s realtime skills to be an invaluable asset for what she brings to my courtroom every day. I can’t imagine not having her here. What would you say to encourage other court reporters to pursue this certification? Hohenstein: Have the confidence to try it and achieve it. I never thought I would, but deep down I had the desire to pursue and achieve it. I think the sky’s the limit. Just keep working on your writing skills and keep practicing and you too will achieve it. Not everyone can do what we can do, or everyone would do it. Be proud of what you have accomplished. The JCR Awards are a way to tell compelling stories that bring to life innovative and successful business strategies from the past year. 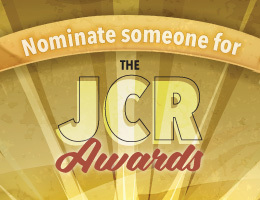 Originally conceived as a way to recognize and highlight the exemplary professionalism, community service, and business practices of NCRA members, the JCR Awards seek nominations for several subcategories, such as best-in-class stories for: Marketing and customer service; Leadership, teambuilding, and mentoring; Use of technology; Community outreach; Service in a nonlegal setting; and Court Reporting & Captioning Week (2016) initiative. In addition, NCRA is looking for a firm and an individual who show excellence in more than one category for an overall “Best of the Year” award. Any current NCRA member in good standing, with the exception of students, may be nominated for these awards. Court reporters, captioners, videographers, scopists, teachers and school administrators, and court reporting managers are all eligible for nomination. Nominate a noteworthy court reporter, captioner, videographer, scopist, teacher, school administrator, or court reporting manager or a group, such as firms, courthouses, or court reporting programs. Self-nominations are accepted. More information about specific criteria for each of the categories is available on the JCR Awards Entry Form. To enter, submit a written entry to the JCR between 300 and 1,000 words explaining the strategies implemented and why they were successful. Ancillary materials, such as photos, may also be submitted with the nomination. Nominations will be considered based on the best fact-based story. Please be prepared to offer documentation, verifiable sources, or other assistance as needed to be considered for these awards. The stories of the finalists will be published as featured articles in the March JCR. Nominations are due by Oct. 31. Read more about the JCR Awards.